Let Boudreaux’s cater your next event! We accommodate events of any size or deliver it to you and set up. Our service includes custom menu design for lunch, dinner or anything in between. We execute your upcoming event with a personal touch to make it unforgettable! Full Service: Service and cleanup for your event is provided by our enthusiastic and professional staff. They will assist in every detail to create a welcoming atmosphere for all your guests. Full Bar: Tailor a bar to compliment your event. Choose from our Signature Boudreaux’s drinks, wine, full bar or domestic and premium beers. Delivery: All the food is delivered and arranged in disposable containers. Only 24 hours notice is necessary to schedule your delivery. $100 minimum. Party Room: Have your event at our West Loop location and get the full Cajun feel. Call 713-838-2200 to reserve your room. Seats a maximum of 40 guests. Contact our catering specialist to schedule your event. Give us a call at 713-858-1360, or fill out and send the form below — we’ll be in touch soon! We recommend contacting us 48 hours in advance. Holidays and weekends generally require more notice due to the high volume of events. 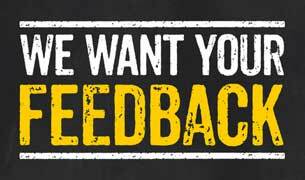 Please share your compliments or concerns with us — we utilize your input to improve our service! 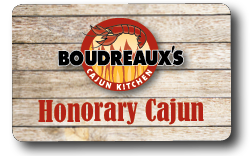 Become an Honorary Cajun and earn Rewards that can be redeemed for Boudreaux’s food and drinks! The concept behind Boudreaux's Cajun Kitchen is simple - prepare great tasting Cajun cuisine made from scratch with the freshest ingredients available, and serve our guests in a quick, friendly, and comfortable environment. Our philosophy has always been to keep a close eye on the quality of our food, while ensuring that our guests are always taken care of — ALWAYS! We'd love to hear from you, so come by or give us a call anytime! Copyright © 2019 Boudreaux's Cajun Kitchen. All rights reserved.